On MSNBC’s Morning Joe today, Steven Rattner presented charts documenting the ever-rising mass shooting tragedies made possible by the outstanding number of guns owned in the US. Further, he shows how gun control can work. The Parkland killings were yet another reminder that no matter how you look at the data, it appears incontrovertible that the United States has too many guns and too many gun deaths. 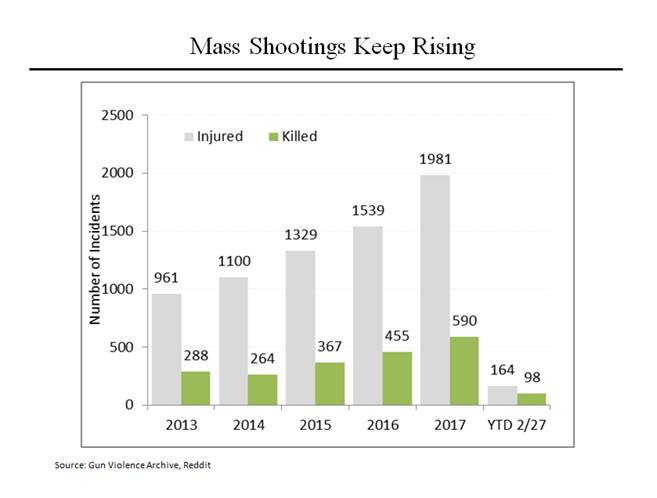 Let’s start with mass shootings (defined for the purpose of this chart as any incident in which 4 or more people were injured or killed, not including the shooter.) 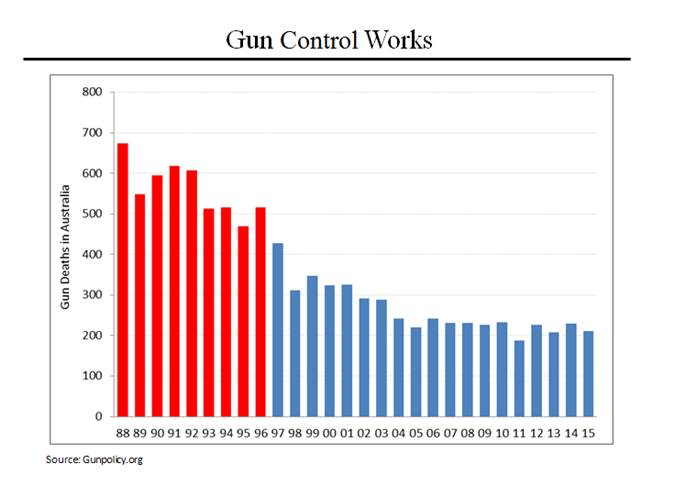 This confirms the popular impression that gun violence involving groups is, indeed, on the upswing. Last year was yet another record and 2018 has started at roughly the same pace. Note that even the shootings that involved the most people – Las Vegas, Orlando, San Bernardino, Sandy Hook, etc. – only comprise a small portion of those who were injured or who died from mass gun violence. 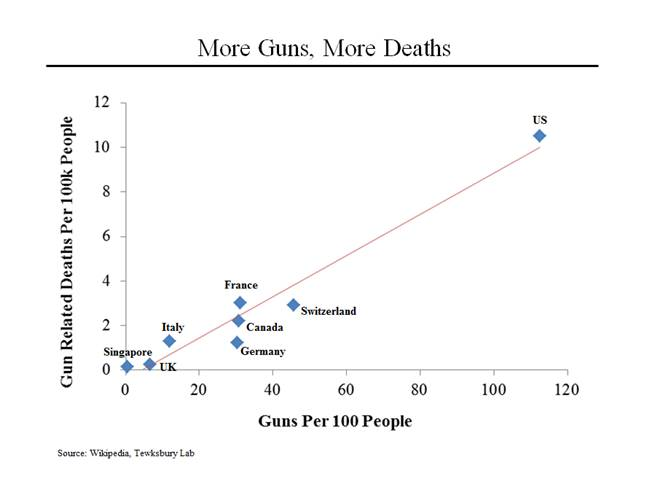 That amounts to 113 guns per 100 citizens and 10 gun deaths per 100,000 inhabitants. As you move down the line in number of guns, the number of guns owned declines and so does the number of gun deaths, until you reach countries like the UK and Singapore, which have few or no guns and correspondingly few gun deaths. Coincidentally, Australian Prime Minister Malcolm Turnbull was in Washington just days after the Parkland shootings. And while both Mr. Turnbull and President Trump tried to emphasize the differences between the two countries, the experience of Australia shows that gun control can make a positive difference. In 1996, a gunman opened fire at a popular tourist destination on the Australian island of Tasmania and killed 35 people. Australia responded by reforming its gun laws. High powered rifles and shotguns were banned, and uniform gun licensing requirements were imposed for the guns that remained legal. 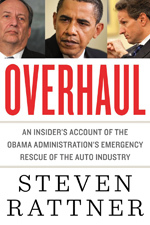 The country also instituted a buyback program, which resulted in the destruction of more than a million guns. Firearm suicides and homicides quickly dropped. In the decade following the passage of the new law, the firearms homicide rate fell by 59% and the firearms suicide rate dropped by 65% — and there were no increases in other types of deaths.